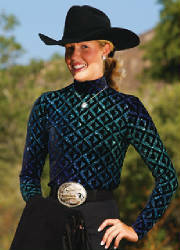 Hobby Horse Ariella Super Slinky, Turquoise ON SALE!!! Hobby Horse Ariella Super Slinky in Turquoise. Clever contrast color makes Ariella's yokes and sleeves stand out against the slenderizing super slinky body. Faux leather motifs, edged with nailheads and shimmering crystals, punctuate the color block design. Super slinky fabric is firm but forgiving; offers complete comfort in the arena. Nylon/Lycra, hand wash. Originally $159. Hobby Horse Cleopatra Super Slinky - ON SALE!!! Hard to find Hobby Horse Cleopatra Super Slinky. This gorgeous slinky has a sand body topped with a whiskey yoke in faux suede. 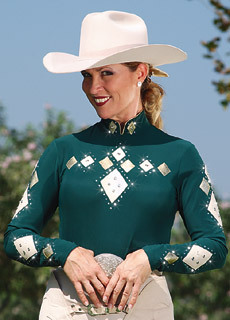 Green faux leather trim is accented gold tone studs and amber colored crystals, finished with a centered oval AB crystal, one front center and one on each sleeve. Hand wash nylon/Lycra. Originally $219. Size: XL - quantities limited! Hard to find Hobby Horse Diora Super Slinky, Limited Edition, Turquoise. Form-fitting black Super Slinky body is topped with stretch glittery velvet, then edged with high-contrast Ultrasuede bands. Swarovski crystals and nailheads define the borders of bodice, collar, and French cuffs. Black with Turquoise contrast. Poly/acetate, hand wash.
Hobby Horse Katura Limited Edition Super Slinky in Sand. Form-fitting sand Super Slinky body is topped with French tan sequin-studded imported lace, then edged with chocolate faux leather bands and dozens of smoky topaz Swarovski crystals. Comfortable and beautiful. Poly/acetate, hand wash. Originally $149. Hobby Horse Guinevere Super Slinky - ON SALE!!! Such good company...wear the Guinevere Super Slinky alone for shapely comfort or layer under the Guinevere vest for a positively regal presentation. Sand with purple and turquoise. Hand wash nylon/Lycra. Sizes: XS, S, M, L, XL - quantities limited! Versatile green and gold color combination with lots of shimmering crystals is a dressy, body-conscious stretch show top for all events; layer under the matching Krystal vest for a dressier appearance. Hand wash.
Hobby Horse Ariella Super Slinky. Clever contrast color makes Ariella's yokes and sleeves stand out against the slenderizing super slinky body. Faux leather motifs, edged with nailheads and shimmering crystals, punctuate the color block design. Super slinky fabric is firm but forgiving; offers complete comfort in the arena. Nylon/Lycra, hand wash. Originally $159. Sizes: XS, S, M, L, XL, 1X - limited quantities & colors; not all colors in all sizes! Hobby Horse Elizabeth Slinky. Elegant Elizabeth slinky has a firm stretch base decorated with glittering geometric design in graduated shades of purple, royal, and teal. Easy to wear but hard to forget. Poly/Lycra, hand wash. Originally $59. Note about discontinued colors: Limited quantities & sizes available; not all sizes available in all colors. It's hard to improve on our classic basic black slinky, but add dozens of bold glittering Austrian crystals on the sleeves and collar, and the Rhinestone slinky (formerly Charlotte slinky) is suddenly stunning! The perfect partner for wearing under all your rhinestoned vests. 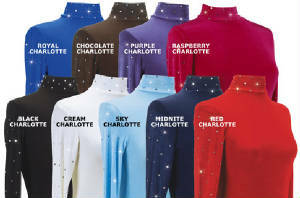 Available in black, chocolate, cream, midnite, purple, raspberry, red, royal, or sky. Also available in girl's sizes. Poly/Lycra, hand wash. 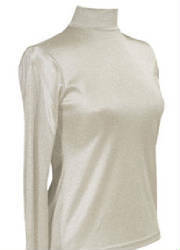 Elegant Luxors feature dressy fine-gauge knit fabrics that drape softly, don't cling. Feels and looks like an exquisite feather-weight sweater, with fabulously accented Austrian crystal and square nailhead collars and cuffs. 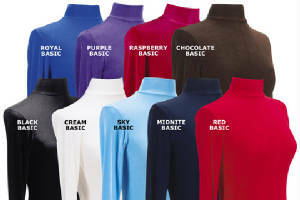 Worn alone or layered under vests, luxurious Luxor slinky tops are the year's must-have new basic. Choose black, blueberry, bordeaux, chambray, champagne, or indigo. Poly, hand wash. These beautiful Hobby Horse metallic slinkies are hard to find! We have most colors available, including Platinum Silver, Limelight Pastel (mint green) and Lavender Pastel (these three are not shown above), but not many and not in all sizes. Please contact us for available colors and sizes. Hobby Horse Midas Slinky. Soft shimmering gold metallic. Hobby Horse's super-stretchy, form-fitted slinky tops are the perfect beginning for great vest and jacket looks. Made just for riders, our slinkies have extra-long sleeves and tails to stay tucked in as you ride. Poly/Lycra or acetate/Lycra, hand wash.
Hobby Horse Quicksilver Slinky. 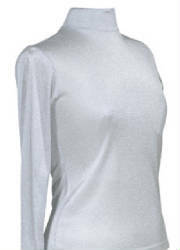 Soft shimmering silver metallic. Hobby Horse's super-stretchy, form-fitted slinky tops are the perfect beginning for great vest and jacket looks. Made just for riders, our slinkies have extra-long sleeves and tails to stay tucked in as you ride. Poly/Lycra or acetate/Lycra, hand wash.
Hobby Horse Stars and Bars fringed slinky in red, white & blue. Very hard to find! Size: Small - only one left! Hobby Horse Austin Fringed Slinky ON SALE!!! Austin Fringed slinky in Royal Blue or Yellow. Hard to find! Hobby Horse Blaze Fringed Slinky ON SALE!!! Blaze Fringed slinky in Royal Blue or Orange. Hard to find!